Located half way between the striking Volterra Cliffs and the rolling hills of San Gimignano, the Pinzani Cheese Dairy benefits from one of the world’s most stunning and unique locations. The ancient craft of cheese-making lives again in ways that reveal the artisans’ attention to craftsmanship and the deliberate choice to use exclusively raw milk. Owner and founder Guido Pinzani took me through his new state of the factory (yes wrapped from head to toe in hygienic protective uniforms). Starting in 1969 - it was clear to see that Guido had lost none of the passion that prompted him to give life to the Caseificio Pinzani after a chance meeting with an old retired cheese maker. Then in 1972, during one of the regular gatherings of shepherds in Siena’s Market Square, he heard the news of the sale of an ancient cottage dairy near Pontignano, the last one to continue the classic Sienese manufacture of raw milk pecorino. The acquisition of that cottage dairy marked the beginning of a long and focused journey that has led Guido Pinzani to specialise exclusively in the production of raw milk pecorino cheese. In 1975 the dairy moved to an area rich in pastures amid the lovely municipalities of Colle Val d’Elsa, Casole, Castel San Gimignano, and Volterra, starting a gradual, but steady increase in production that offered the company an opening into the distribution market. The sheep, all Sardinian, graze in a free range amid these hills, free to enjoy an exceptional environment and a unique territory. 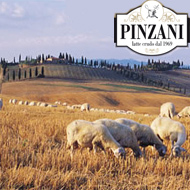 Today Pinzani is the only one to produce raw milk pecorino in a structured way. I had the rare opportunity to watch the entire process that the cheese goes through, plus visited the impressive ageing rooms, where thousands of rounds of cheese mature to produce these award winning cheeses. Just like the importance of ‘terroir’ in wine - these carefully chosen pastures impart a unique sensory trait, an integral part first on the milk, then on the cheese. The peculiarities of the area, the soil, the climate, and the vegetation characterise and leave an enduring trace on the cheeses. Pinzani pecorino cheese has a rich and special taste, of broad and complex aromas and of outstanding quality. 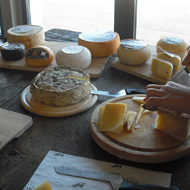 The chesses we worked through included: Classico Pecorino Senese, Classico Riserva, I' Serbo, I' Rugoso, I' Blu, Marzolino, Pecorino Nero, Pecorino al Pepe, Pecorino al Tartufo, Tartufo Riserva, Pecorino allo Zafferano and Ricotta di Pecora. The use of raw milk demands greater skill and attention in manufacturing. For this reason Pinzani follow with extreme care of all phases of the process, the utmost hygiene in production, storage, and manufacturing are a guarantee for the customer and an essential requirement for producing a high quality pecorino.